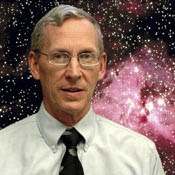 Don DeYoung, Ph.D. (pictured), professor of physics at Grace College and author of the BMH book Pioneer Explorers of Intelligent Design, explains how nature has inspired some of the greatest inventions and medical breakthroughs on a new Web site, discoveryofdesign.com. This Web site features a different design every month, with all of the previous designs easily accessible. For example, DeYoung featured the kingfisher in January of 2009. This bird, native to Canada and northern regions of the United States, inspired Japanese engineers with their design of engines for bullet trains. Previously, the trains had caused sonic booms, which disturbed people living within several miles of the tracks. The Japanese studied the design of the kingfisher’s beak and redesigned many of their train engines to have long, tapered noses. This design creates less noise and increases energy efficiency. Other cases where nature has solved technological problems, or provided for needs, can be found on the Discovery of Design Web site. “God has embedded countless design ideas in nature, and He’s just waiting for us to discover them,” DeYoung once said during Chapel services at Grace.